IF YOU FEEL like you keep reading about diversity in tech, well, that’s because there is still not enough … diversity in tech. The juggernauts of the first computing revolution like HP and IBM actually had reasonable gender diversity, and IBM had its first female VP back in 1943. But fast forward to 2014 and just 31 percent of Facebook’s employees are women. Same at Apple. The company has hired a new head of diversity and inclusion and says it’s on its way to changing this, and indeed, half of all the company’s hires from 2016-2017 were from minority groups. One of the reasons for this may be the way companies try to recruit talent. Stanford researchers observed more than 75 recruiting sessions held by more than 60 companies and identified countless seemingly obvious ways the recruiters might be alienating female recruits, from sexist jokes to presentations displaying only slides of men. Others have found that male-dominated industries tend to use masculine language that doesn’t appeal to women. The Braid Initiative—with help from the likes of Facebook, Microsoft, and Harvey Mudd College—has been making a concerted effort to change this by encouraging universities to modify their Intro to CS courses. The effects are promising: when UC-Berkeley changed the title of its introductory computer science for non-majors to “The Beauty and the Joy of Computing,” female enrollees outnumbered male ones for the first time ever. When we just look at race, and if we look at CS majors relative to their respective populations, a slightly different picture emerges. 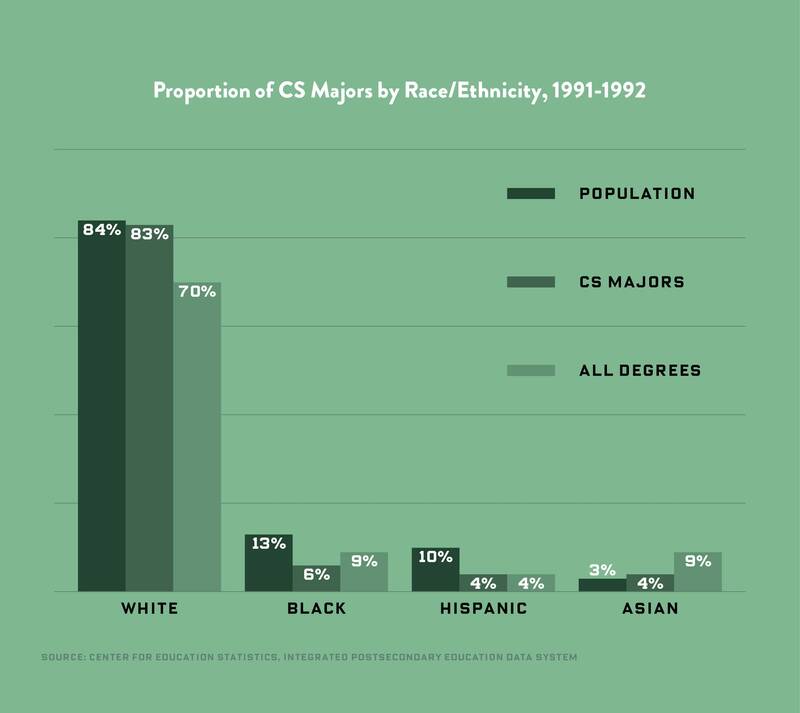 Back in 1992, 70 percent of computer science grads were white. That number has dropped by 8 percent since then, and the representation of other groups has increased a bit, proportionally. But the continuing lack of diversity in computer science majors can’t be explained by sheer population growth. 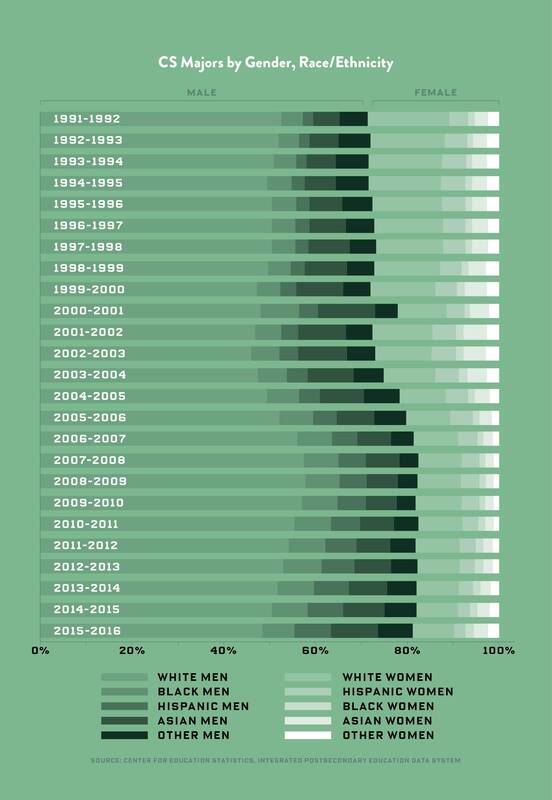 White people are earning college degrees at more or less the same rate that they were in 1991. 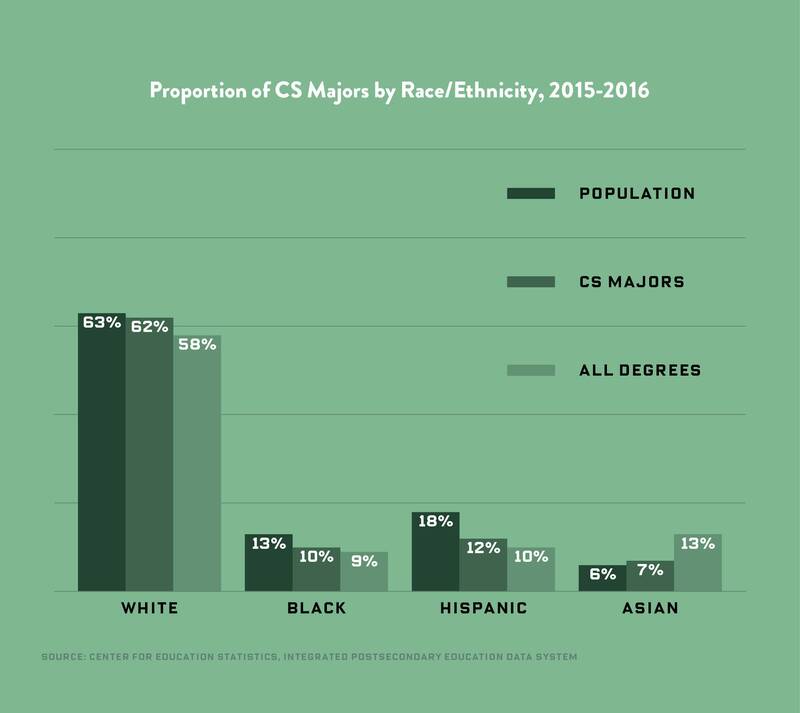 Overall, more black people and Hispanic people are earning college degrees, but only Hispanic people seem to be entering the CS discipline. It’s hard to know why, but there are clues. A 2016 report from Google found that black and Hispanic students were 1.5 and 1.7 times more likely to have an interest in learning CS. And while the nation has, overall, increased the number of CS course offerings in K-12 education, black and Hispanic students are less likely to have access to those resources. They’re also at a disadvantage outside of the classroom: Two-thirds of white students report using computers at home, whereas only half of black and Hispanic students do. 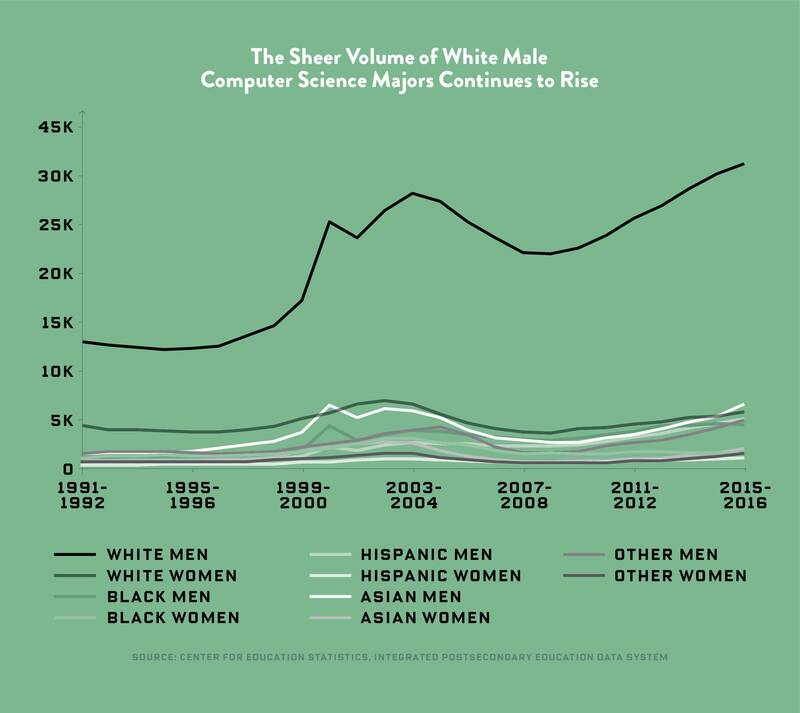 And even the perceived gaps being filled by underrepresented minorities proportionally in the chart above are actually being hijacked, numbers-wise, by men. And the irony is, today, more women than men earn college degrees, even as the number of women studying computer science is falling. This problem has existed since the 1970s, when typing stopped being considered an asset for computer science, Harvey Mudd College president Maria Klawe told WIRED. “Women were majoring in computer science because it was something they were expected to be good at.” Since then, the number of women studying CS has been falling pretty steadily since the 80s, despite the increase in demand for these types of skills. A study from Georgetown University found that more women are studying STEM majors, they’re just not choosing computer science. Biology, by contrast, has seen an increase in female majors, from 51 percent in 1992 to 60 percent today. That said, the wage gap persists. 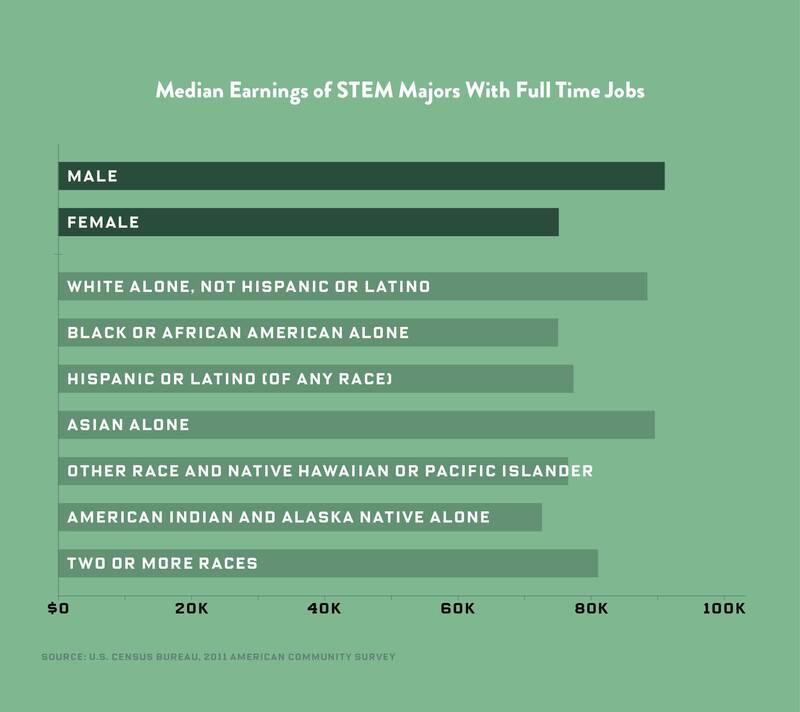 Women in STEM make $16,000 less on average than their male counterparts, and if you’re black or Hispanic, you might be making $14,000 less than your white coworker. As (some) companies make strides to diversify their workforces, let’s hope they focus on wage parity as well.